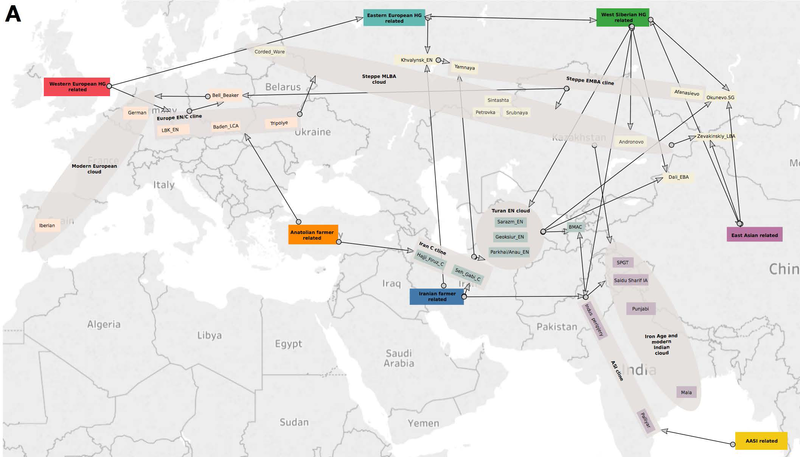 The awaited, open access paper on Asian migrations is out: The Genomic Formation of South and Central Asia, by Narasimhan et al. bioRxiv (2018). NOTE. 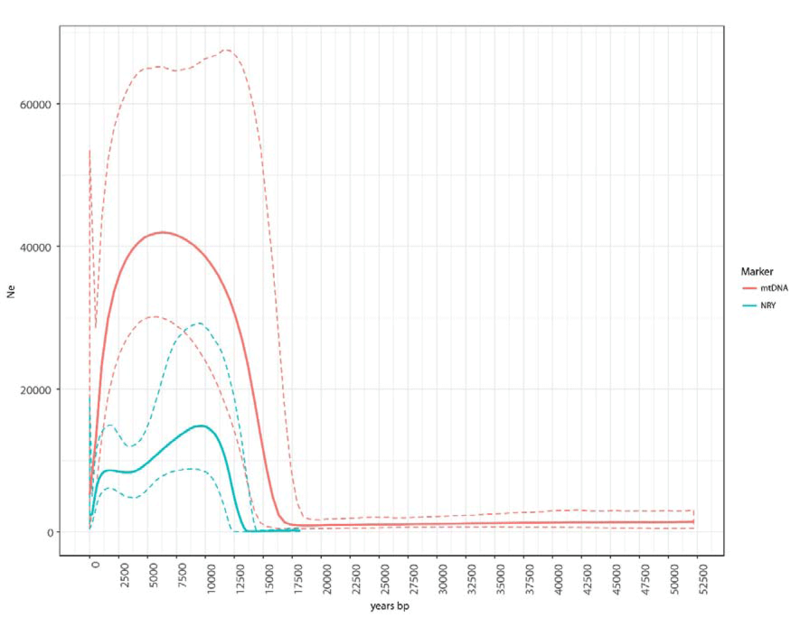 The supplementary material seems to be full of errors right now, because it lists as R1b-M269 (and further subclades) samples that have been previously expressly said were xM269, so we will have to wait to see if there are big surprises here. 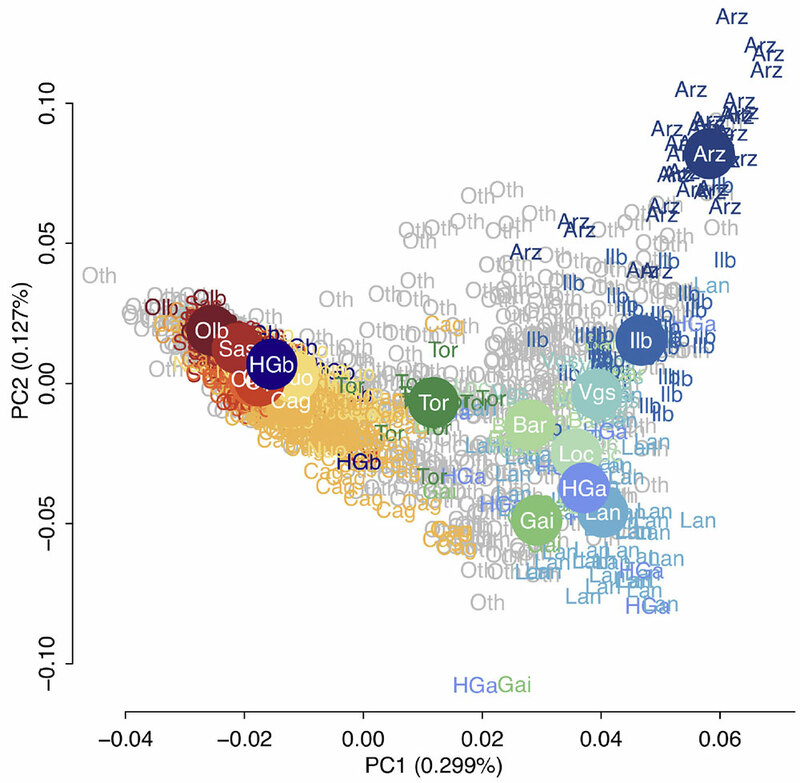 So, for example, samples from Mal’ta (M269), Iron Gates (M269 and L51), and Latvia Mesolithic (L51), a Deriivka sample from 5230 BC (M269), Armenia_EBA (Z2103)…Also, the sample from Yuzhnyy Oleni Ostrov is R1a-M417 now. 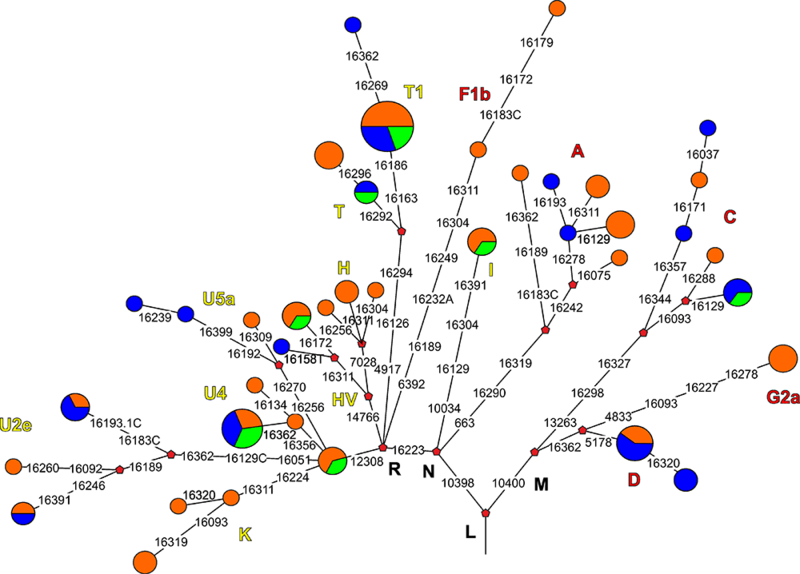 EDIT (1 APR 2018): The main author has confirmed on Twitter that they have used a new Y Chr caller that calls haplogroups given the data provided, and depending on the coverage tried to provide a call to the lowest branch of the tree possible, so there are obviously a lot of mistakes – not just in the subclades of R. A revision of the paper is on its way, and soon more people will be able to work with the actual samples, since they say they are releasing them. 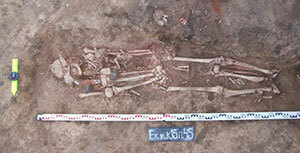 New samples of East Yamna / Poltavka are of haplogroup R1b-L23. Afanasevo is confirmed to be dominated by R1b-M269. 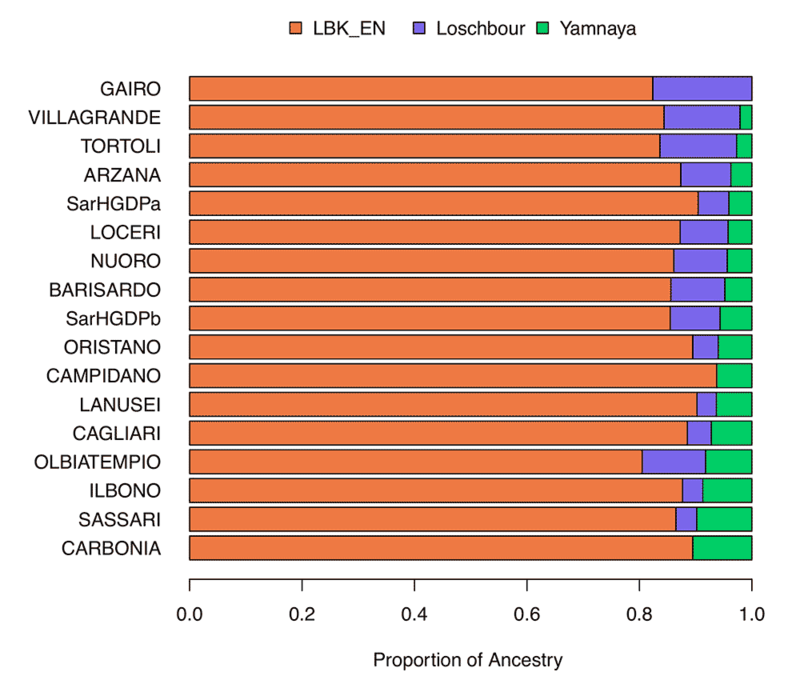 Sintashta, as I predicted could happen, shows a mixed R1b-L23/ R1a-Z645 society, compatible with my model of continuity of Proto-Indo-Iranian in the East Yamna admixture with late Corded Ware immigrants. A sample from Hajji Firuz in Iran ca. 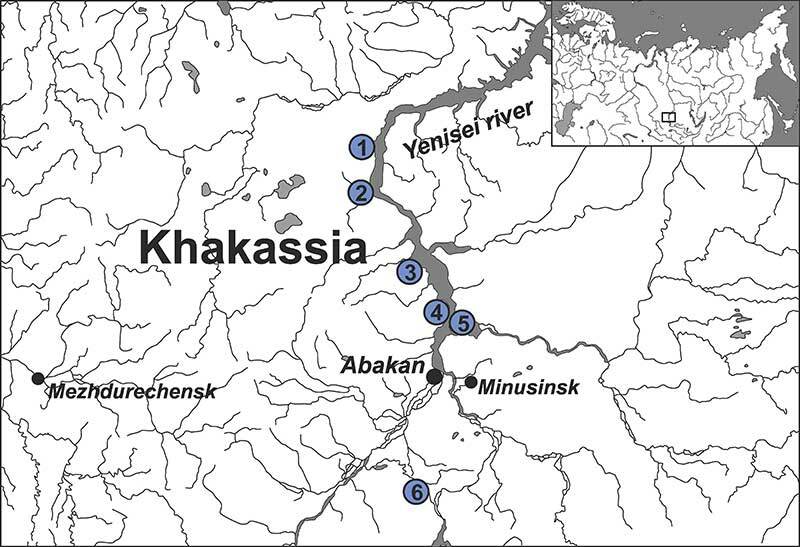 5650 BC, of subclade R1b-Z2103, may confirm Mesolithic R1b-M269 lineages from the Caucasus as the source of CHG ancestry to Khvalynsk/Yamna, and be thus the reason why Reich wrote about a potential PIE homeland south of the Caucasus . 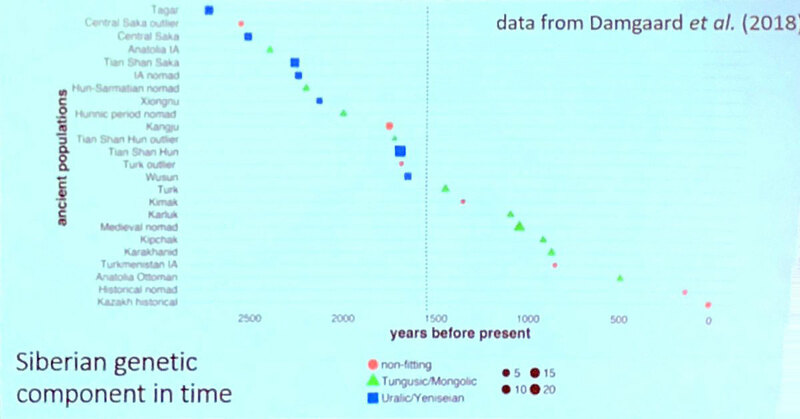 (EDIT 11 APR 2018) The sample shows steppe ancestry, therefore the date is most likely incorrect, and a new radiocarbon dating is due. 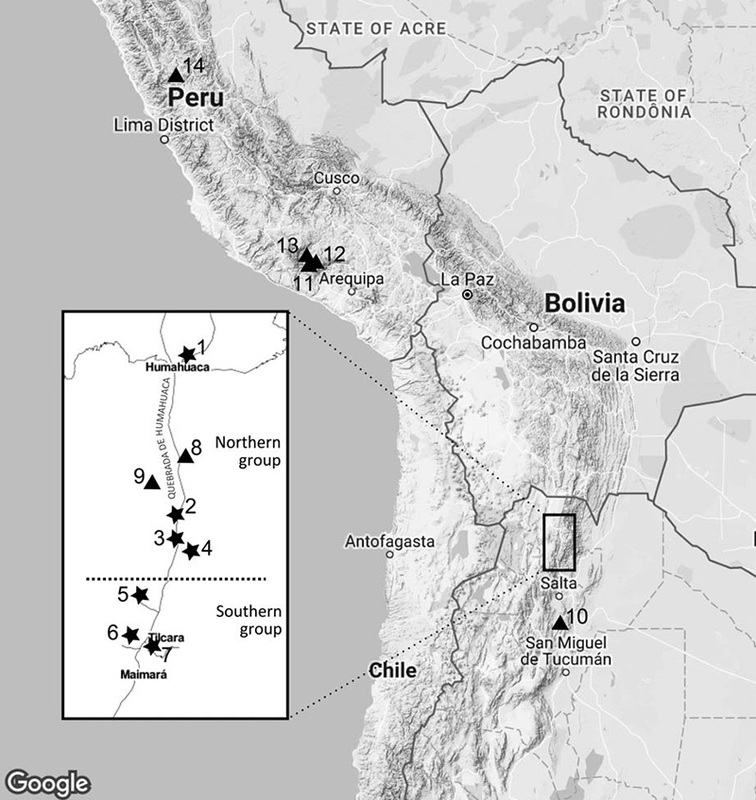 It is still interesting – depending on the precise subclade – for its potential relationship with IE migrations into the area. 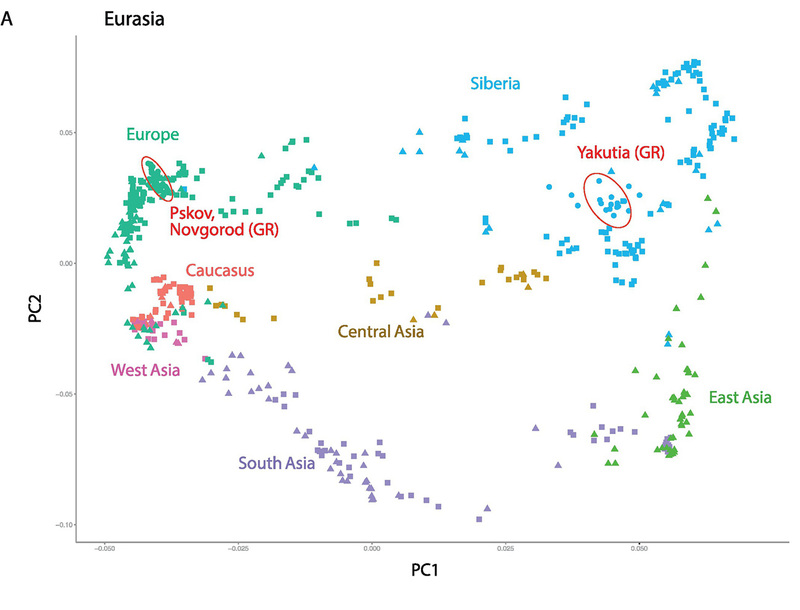 New samples of East Yamna / Poltavka are of haplogroup R1b-Z2103. 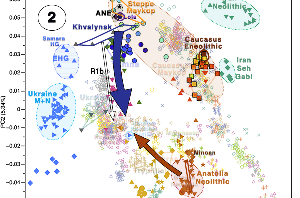 Afanasevo migrants are mainly of haplogroup R1b-Z2103. The Darra-e Kur sample, ca. 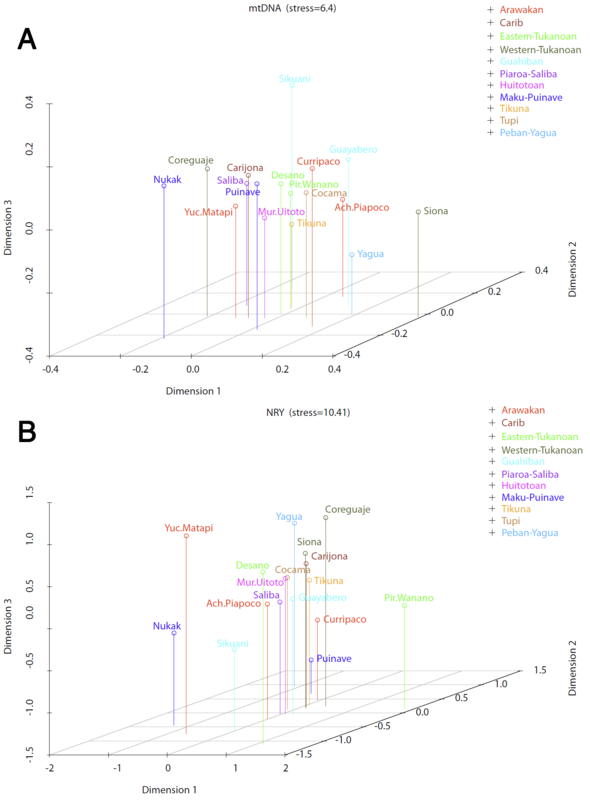 2655, of haplogroup R1b-L151, without a clear cultural adscription, may be the expected sign of Afanasevo migrants (Pre-Proto-Tocharian speakers) expanding a Northern Indo-European (in contrast with a Southern or Graeco-Aryan) dialect, in a region closely linked with the later desert mummies in the Tarim Basin. 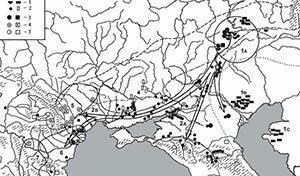 Its early presence there would speak in favour of a migration through the Inner Asian Mountain Corridor previous to the one caused by Andronovo migrants. Sintashta shows a mixed R1b-Z2103 / R1a-Z93 society. Later Indo-Iranian migrations are apparently dominated by R1a-Z2123, an early subclade of R1a-Z93, also found in Srubna. R1b is also seen later in BMAC (ca. 1487 BC), although its subclade is not given. 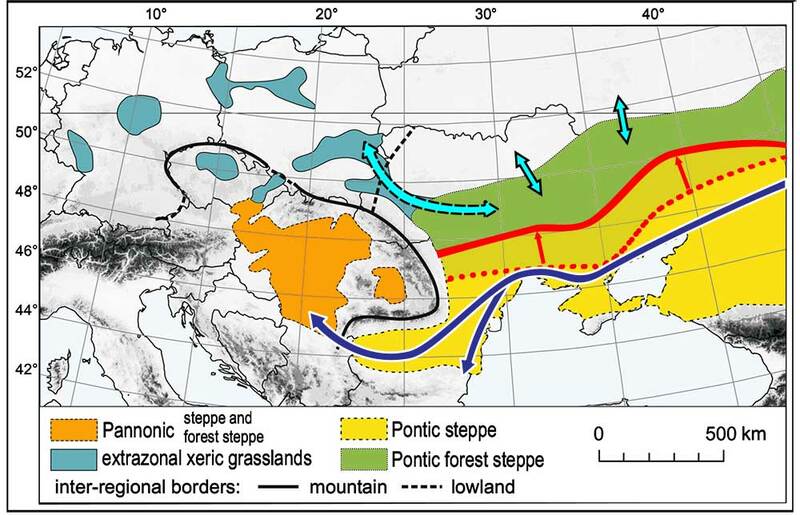 There is also a sample of R1a-Z283 subclade in the eastern steppe (ca. 1600 BC). 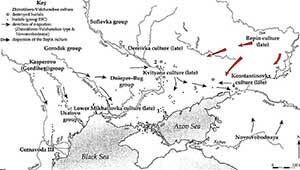 What may be interesting about it is that it could mark one of the subclades not responsible for the expansion of Balto-Slavic (or responsible for it with the expansion of Srubna, for those who support an Indo-Slavonic branch related Sintashta-Potapovka). A sample of R1b-U106 subclade is found in Loebanr_IA ca. 950 BC, which – together with the sample of Darra-e Kur – is compatible with the presence of L51 in Yamna. NOTE. 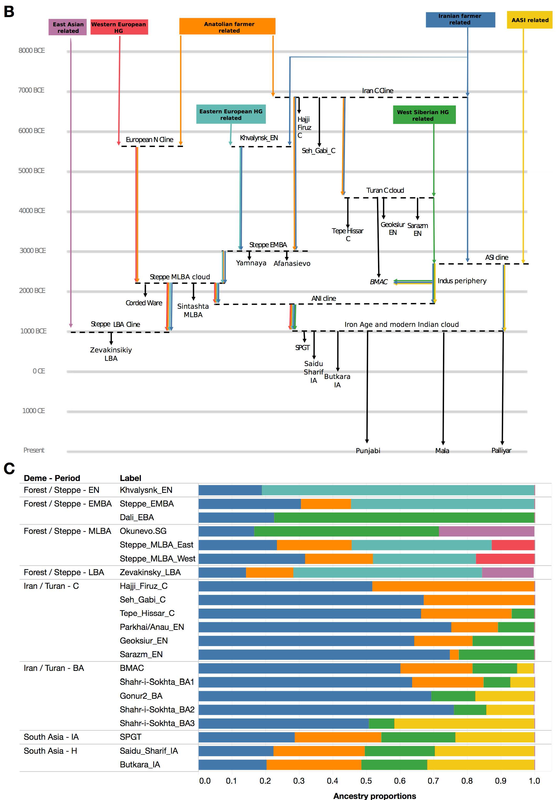 Errors in haplogroups of previously published samples make every subclade of new samples from the supplementary table questionable, but all new samples (safe for the Darra_i_Kur one) were analysed and probably reported by the Reich Lab, and at least upper subclades in each haplogroup tree seem mostly coherent with what was expected. 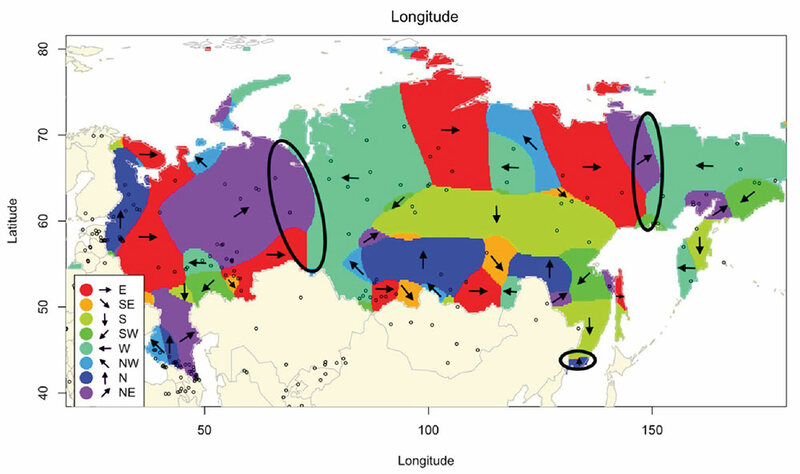 Also, the contribution of Iranian Farmer related (a population in turn contributing to Hajji Firuz) to Khvalynsk in their sketch of the genetic history may be a sign of the association of R1b-M269 lineages with CHG ancestry, although previous data on precise R1b subclades in the region contradict this. (EDIT 11 APR 2018) The sample of Hajji Firuz is most likely much younger than the published date, hence its younger subclade may be correct. 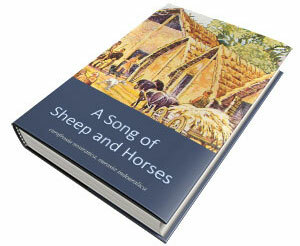 No revision or comment on this matter has been published, though. “Modeling results. 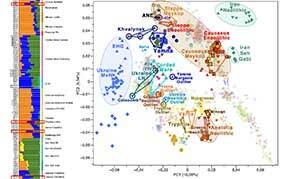 (A) Admixture events originating from 7 “Distal” populations leading 538 to the formation of the modern Indian cloud shown geographically. 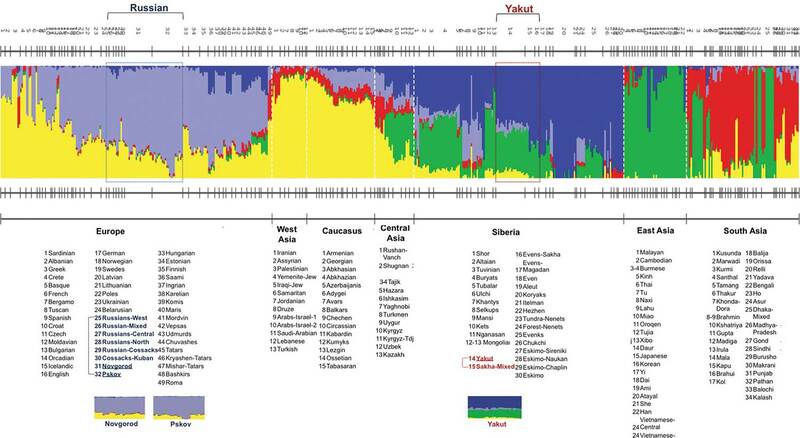 Clines or 2-way mixtures of 539 ancestry are shown in rectangles, and clouds (3-way mixtures) are shown in ellipses. 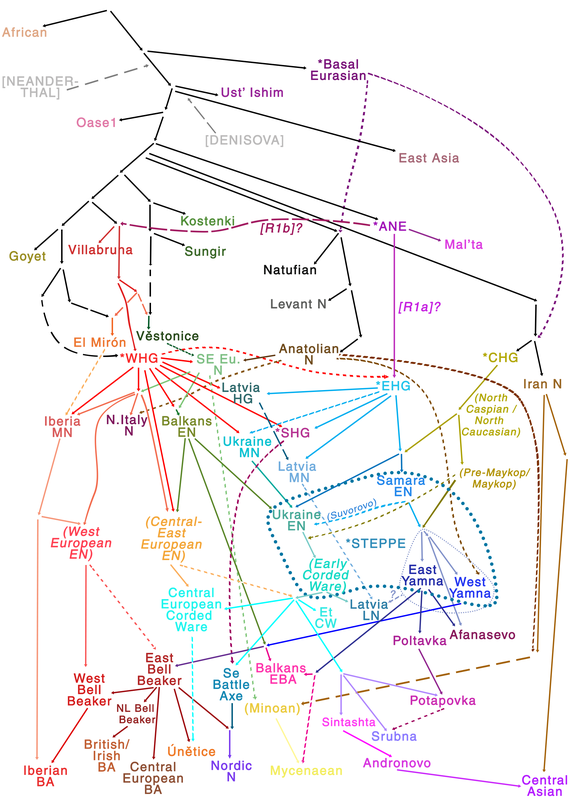 and the schematic genetic model below, similar to my previous tentative sketch of the genetic history of West Eurasia. 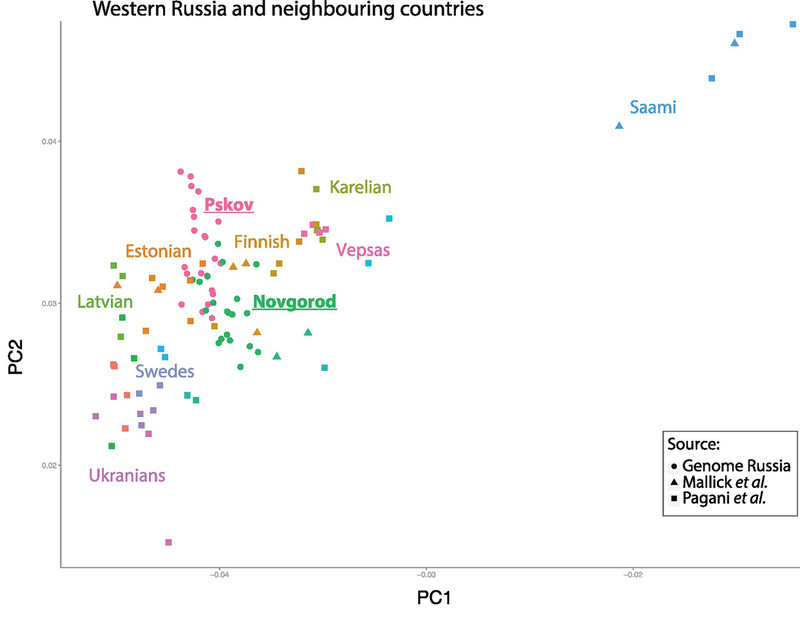 Our results also shed light on the question of the origins of the subset of Indo-European languages spoken in India and Europe (45). 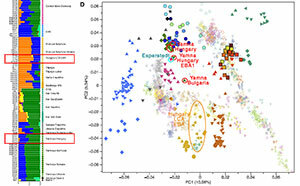 It is striking that the great majority of Indo-European speakers today living in both Europe and South Asia harbor large fractions of ancestry related to Yamnaya Steppe pastoralists (corresponding genetically to the Steppe_EMBA cluster), suggesting that “Late Proto-Indo-European”—the language ancestral to all modern Indo- European languages—was the language of the Yamnaya (46). 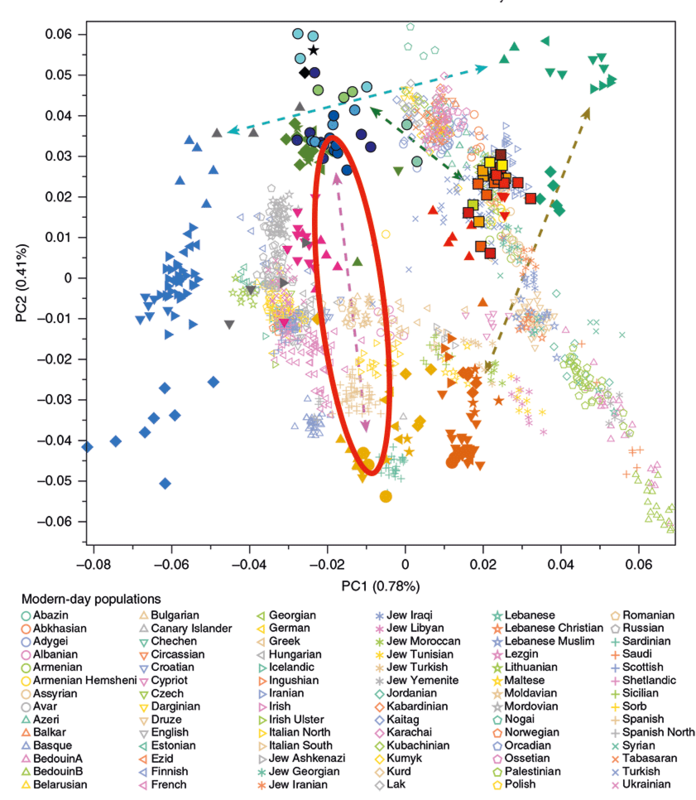 While ancient DNA studies have documented westward movements of peoples from the Steppe that plausibly spread this ancestry to Europe (5, 31), there has not been ancient DNA evidence of the chain 488 of transmission to South Asia. 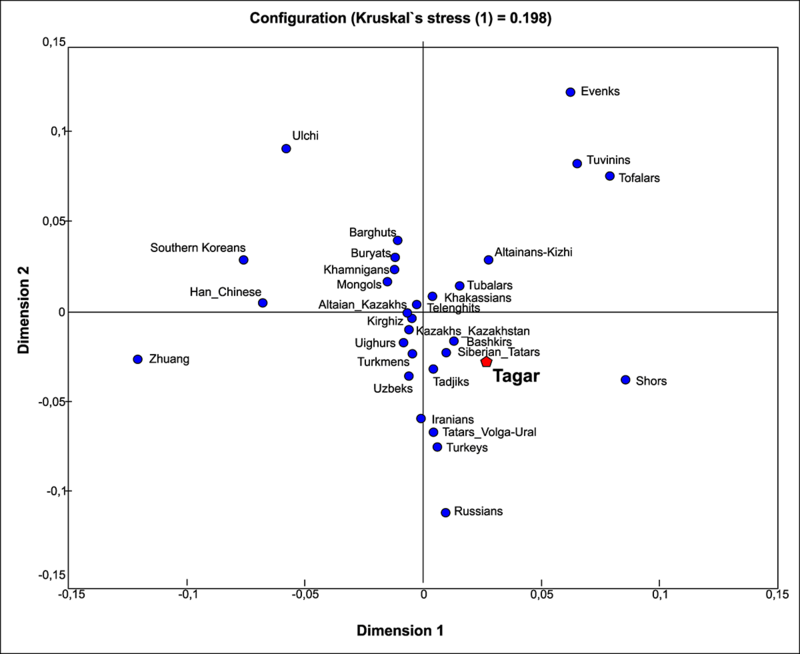 Our documentation of a large-scale genetic pressure from Steppe_MLBA groups in the 2nd millennium BCE provides a prime candidate, a finding that is consistent with archaeological evidence of connections between material culture in the Kazakh middle-to-late Bronze Age Steppe and early Vedic culture in India (46). 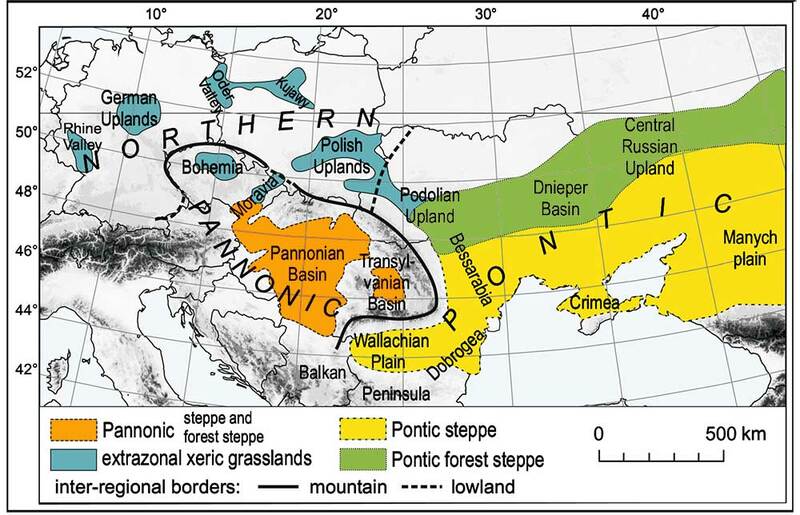 EDIT (1 APR 2018): I corrected this text and the word ‘official’ in the title, because more than rejecting the role of Corded Ware migrants in expanding Late PIE, they actually seem to keep considering Corded Ware migrants as continuing the western Yamna expansion in the Carpathian Basin, so no big ‘official’ change or retraction in this paper, just subtle movements out of their previous model. “Modeling results. 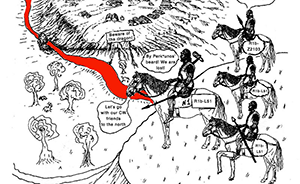 (B) A 540 schematic model of events originating from 7 “Distal” populations leading to the formation of 541 the modern Indian cline, shown chronologically. 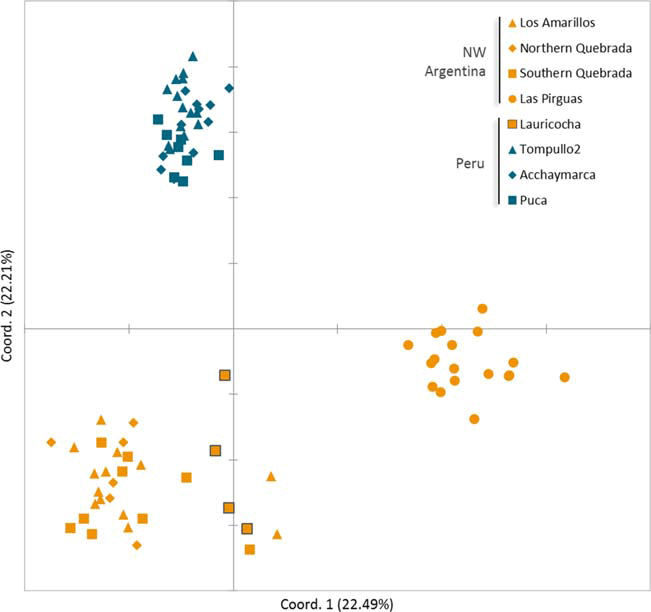 (C) Admixture proportions as estimated 542 using qpAdm for populations reflected in A and B. NOTE. 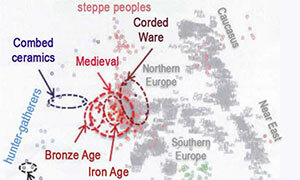 If they correct the haplogroups soon, I will update the information in this post. Unless there is a big surprise that merits a new one, of course. 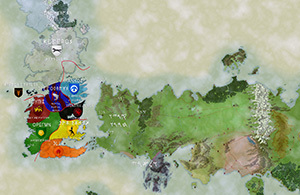 EDIT (1 APR 2018): Multiple minor edits to the original post. How We, The Indians, Came to Be, by Tony Joseph. 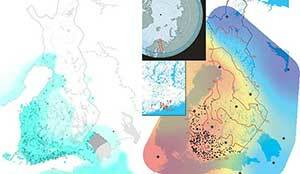 Aryan migration: Everything you need to know about the new study on Indian genetics, by Rohan Venkataramakrishnan. 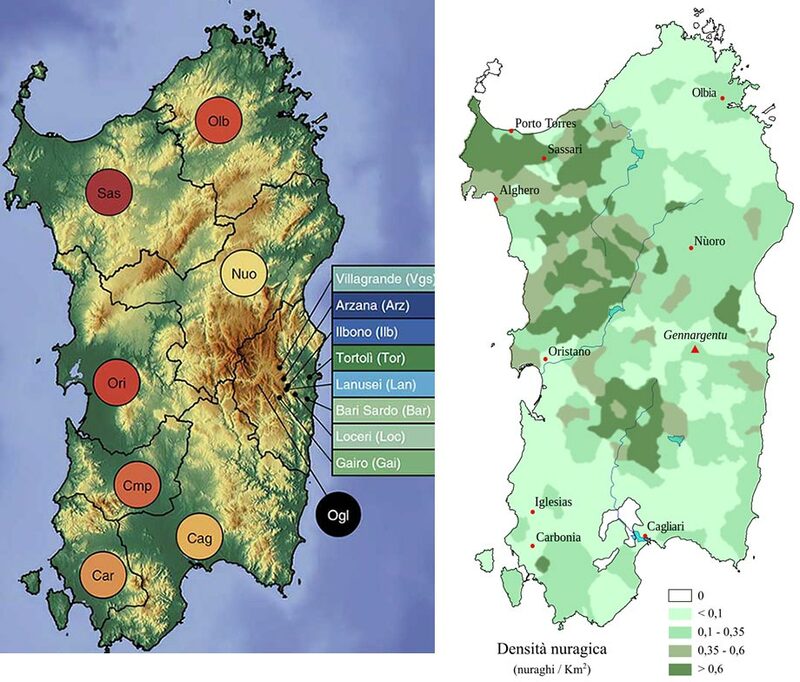 The Maturation Of The South Asian Genetic Landscape, by Razib Khan.